In an art world that celebrates the work of Raymond Pettibon, it seems to me that Steinberg deserves another look. 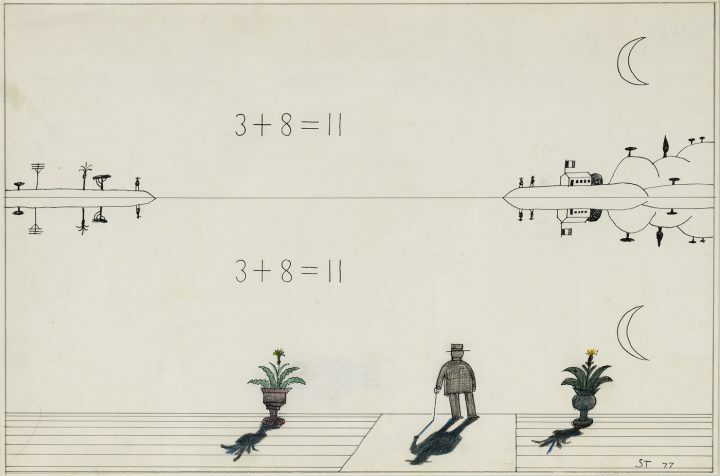 A few months ago, I reviewed Eyes Wide Open: Saul Steinberg and Philip Guston at Senior & Shopmaker Gallery, which got me thinking about Steinberg, whose work needs to be reconsidered. Steinberg’s life story – and how he brought it into his work – seems especially relevant in an age when immigrants, the dispossessed, and stateless are hated, and a significant percentage of the American people consider them “invaders.” Let’s face it, the hatred and vilification of the other, which has long been a feature of American life, has become normalized by many elected officials on every level, from the county to the entire country. Steinberg, who was Jewish, was born in Romania in 1914, just before World War I breaks out. In 1933, he immigrates to Milan to study architecture because his application is rejected in Romania, most likely because he is Jewish. In 1936, in order to earn some money, he begins working as a cartoonist for Bertoldo, a humor magazine, and soon becomes one of its most popular contributors. In 1938, under the reign of Benito Mussolini, Jews are forbidden from many professions. What saved Steinberg and gave him a place in the world is drawing. All he needed was a pencil and paper. It enabled him to be mobile, to set up wherever he had a flat surface. Being dispossessed must have haunted him his whole life, as did the endless bureaucracy involved with getting the documents you need to travel from one country to another, to settle into a new place. While a consideration of exile was not necessarily the intention of the exhibition, Saul Steinberg: Untitled, at TOTAH (February 21-April 21, 2019), it was certainly among the thoughts I had while walking this tight, terrific show. As much as I enjoyed Steinberg’s work in The New Yorker, starting in the late 1960s, he is obviously so much more than a cartoonist. And yet that is how he has been pigeonholed by the art world, and not only on account of his cartoons. I think he has been marginalized because he is an inventive draftsman who never took himself seriously enough to attempt making a masterpiece. He also often used devices in counterpoint to his draftsmanship, such as rubber stamps, that underscored his playfulness (while, in the case of the rubber stamp, tapping into dark historical currents). In a world where sculptures are often bigger than a cottage, it is easy to think of Steinberg’s work as slight. But easy thoughts are just that. There are more than 30 works in the exhibition, starting with four pen-and-ink drawings dated 1939-41, when he was still living in Milan, using a pseudonym, and depending on friends for jobs, to work from 1991, a span of more than 50 years. While his work did not evolve, at least in the way art critics and art historians use that word, he developed a remarkably flexible style that was capable of absorbing and reformulating other styles (Futurism, line drawing, architectural cutaways, and the basic rules of landscape painting) into something recognizably his. What comes through many of the works in this exhibition is a feeling of isolation, of anonymity, of being a witness, all touched with a light sense of humor. At times, he does something very smart in such an understated way that we might not get it until a few moments later – which is not how a cartoonist works. In “Untitled” (1977), a formally dressed man with a cane stands on a boardwalk, looking at a calm expanse of water. In the distance, a spit of land extends inward from the two sides of the paper. A flag that could be French or Italian is visible on the right spit. A scimitar moon is seen on high, in the drawing’s right-hand corner. The water is so still that all of these elements are precisely mirrored on its surface. Steinberg could have stopped here, but he did not. In the sky, we see the equation, 3 + 8 = 11. This is repeated in the water below. One and eight (along with zero) are four-way symmetrical numbers, which remain the same when flipped upside down or mirrored, while three is only vertically symmetrical. The equation Steinberg has written would be perfectly reflected in the water because he has chosen vertically symmetrical numbers. Nonetheless, the drawing is a complete enigma. The formally dressed man in the drawing is a surrogate for the artist and the viewer alike: we are witnesses to the incomprehensibility of the world around us. Steinberg’s use of a rubber stamp in many of his postcard-sized landscapes, usually arranged in a configuration of four or more on a sheet of paper, underscores bureaucracy’s control over us. We are named and tracked by documents. At the same time, it also becomes the artist’s seal, an allusion to the signature stamps on Japanese prints. Finally, as it floats in the sky above one or more anonymous figures – relatives to the formally dressed man in “Untitled” – the seal becomes both a black sun and government’s authority over its citizens. Steinberg was acutely aware of being a witness to that authority. This partially explains his interest in masks, one of which is included in the exhibition. Sometimes his work memorializes an ordinary, everyday moment, as in the construction, “The Venice Table” (1979), a panel done in oil paint on canvas, collage, painted wood, ink, and pencil on wood, and measures 17 by 12 inches, the size of a large sketchbook. There are two oil paintings on strips of canvas, one vertical and one horizontal, collaged onto the wood panel, the former placed above the latter. In the vertical canvas, a stout woman in an ankle-length blue coat faces a grey, indeterminate, and abstract atmosphere. Steinberg has affixed a number of trompe l’oeil collage elements around the little painting, a “slice of brown bread” on the right, while to the left he has placed a “cucumber slice.” The other faux-objects surrounding the painting are a large “metal button” with “June 1979” written on it, and an oval rubber stamp and a receipt, both indecipherable. 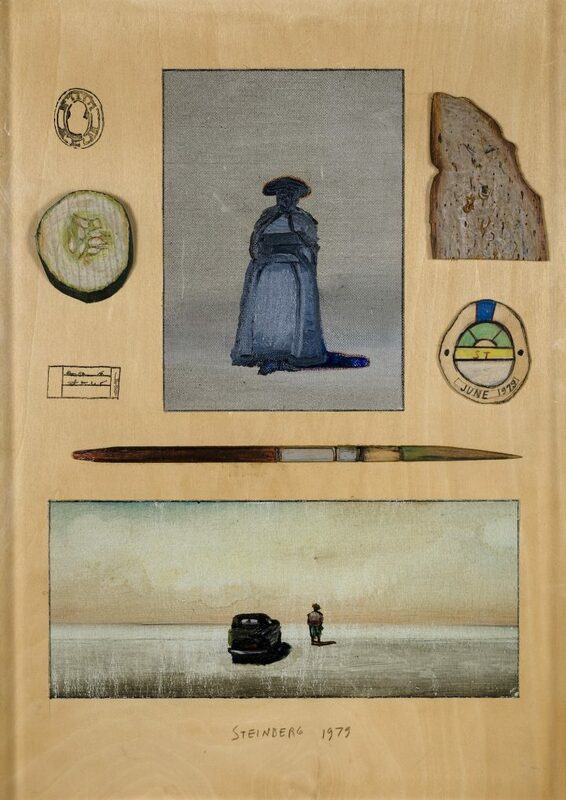 Below this grouping, Steinberg has attached a used “paintbrush” made entirely of wood as a kind of horizon line. In the horizontal painting below, a man in a hat stands beside a parked car, looking at the washed out, mottled, pinkish sky. We are witnesses and, at times, we can doing nothing more than watch time move by. In other works that Steinberg based on his travels, such as “Mombasa” (1969) and “Cairo” (1981), his roles as a witness, a tourist, and a member of the dispossessed are merged. With his mastery of caricature and his first-hand observations, which are depicted as if seen through the eyes of anonymous men, Steinberg exemplifies Charles Baudelaire’s flâneur, the “passionate spectator” of everyday life. 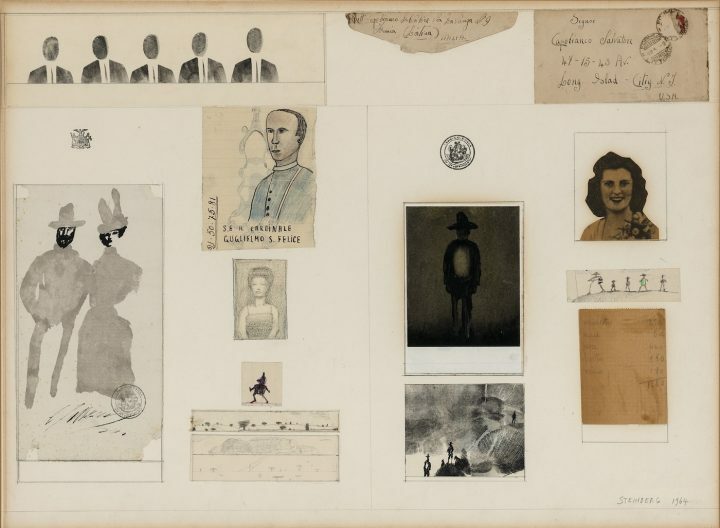 It seems to me that in his constructions, Steinberg shares something with Joseph Cornell — a penchant for exactitude and an acute sensitivity to history and lost time. And like Cornell, he returns to a handful of themes throughout his life. But this is just one part of what Steinberg does with materials and processes. 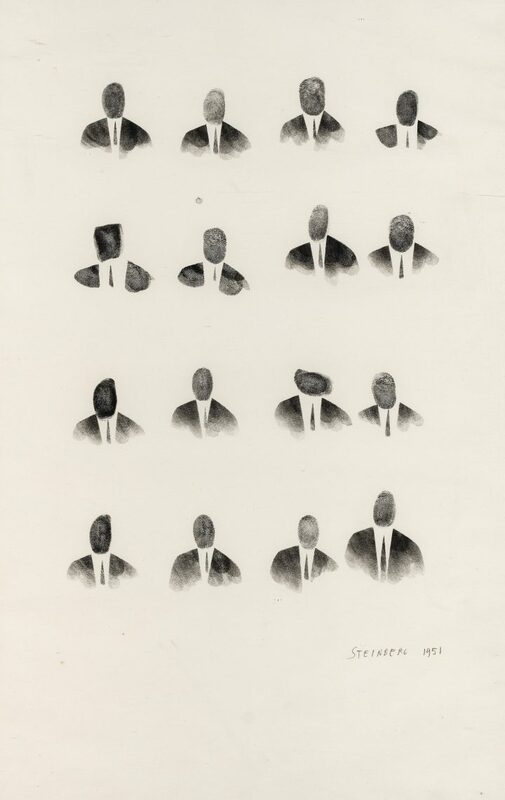 There is a drawing called “Passport Photos” (1951) a grid of 16 men’s faces done entirely in fingerprints, another identifying marker. This drawing was obviously made long before Chuck Close used the same technique of fingerprints and stamping ink to make a work. What keeps coming through in Steinberg’s work is how close each of us is to anonymity, and how the apparatuses of the state are oriented towards grinding its citizens down, making them both faceless and identifiable. In the four corners of the collaged panel, “Venice Table” (1981), a work related to “The Venice Table” of 1979, he depicts four women as if they are posing for an old-fashioned portrait photo, but their faces have started to degenerate, as if the photographic emulsion had gone rancid. I think this side of Steinberg has not been explored fully enough: his material inventiveness. At the same time, there is the artist’s gentle, off-kilter humor, as in the line drawing, “Trotzky in New York” (1982). The caption reads: “Leon Trotzky has apple pie and tea at the automat on B’way and 47th Street, January 28, 1917.” On January 13, 1917, Trotsky, his wife Natalia Sedova, and their children, Lev and Sergei, disembarked from the steamship Montserrat in New York. In February 1917, Czar Nicholas II, ruler of Russia since 1894, was forced to abdicate the throne. You can bear witness, even if you are not at the scene. 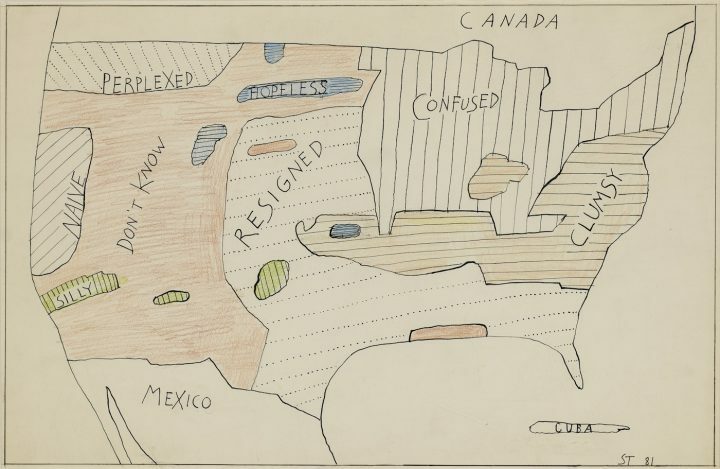 In “Statistics U.S.A.” (1981), he sections off a map of the US with new territories, labeling them: Naïve, Perplexed, Clumsy, Confused, Silly, Hopeless, Don’t Know. One wonders how he might label today’s America. In an art world that celebrates the work of Raymond Pettibon, it seems to me that Steinberg deserves another look. His lifelong feelings of displacement and of bearing anonymous witness – one of many who see first-hand what’s going on – informs much of his work. In Steinberg’s world, wonderment, humor, melancholy, caricature, isolation, tenderness, and satire are all rolled into one. Saul Steinberg: Untitled continues at TOTAH (183 Stanton Street, Lower East Side, Manhattan) through April 21.